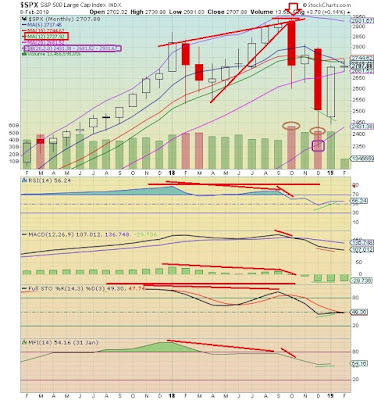 On the SPX monthly, the red lines show the negative divergence with the chart indicators, overbot conditions, and ominous rising wedge, that Keystone used when he called the top in the stock market in September; the only Wall Street analyst to do so (red arrow). The other analysts and television pundits were telling you to buy, buy, buy! That did not work out so well for Aunt Emily that invested her entire life savings in the stock market in late September. The S&P 500 violated the upper standard deviation band (purple) so the middle band was in play, which was tagged at 2630-ish in October. The lower band was also in play and price fell like a rock to tag it at 2350 in December. The SPX was due for at least a dead-cat bounce after the -20% crash, but this turned into a rocket-fueled recovery move on global central banker dovishness and happy US-China trade talk. The global central bankers act in collusion and orchestrate the record-setting recovery in January printing money like madmen. The central bankers panicked after the 1/3/19 selloff stepping in to stop the drop. Always remember, the central bankers are the market. The 6-month MA sloping negatively signals an ongoing cyclical bear market in play. The 12-month MA at 2728 is the top decider of intermediate and long-term stock market direction and price is below so equities are in a cyclical bear market pattern. The importance of this number cannot be overstated; 2728 is for all the marbles. Look at this month's (February) candlestick. Price came down to kiss the 20-month MA support at 2681 and bounced. On the upper end, price came within a couple bucks of the 10-month MA at 2745 and failed. Price now sits smack-dab in the middle of that whole range wondering what to do. The SPX must move above the 6-month MA to curl it higher which would negate the ongoing cyclical bear market so watch that 2717 level closely. Even if the bulls move above, however, it will likely take a few months to turn the 6 MA higher. If the bulls overtake 2728, that is a huge deal and signals that the cyclical bull market is back in play. 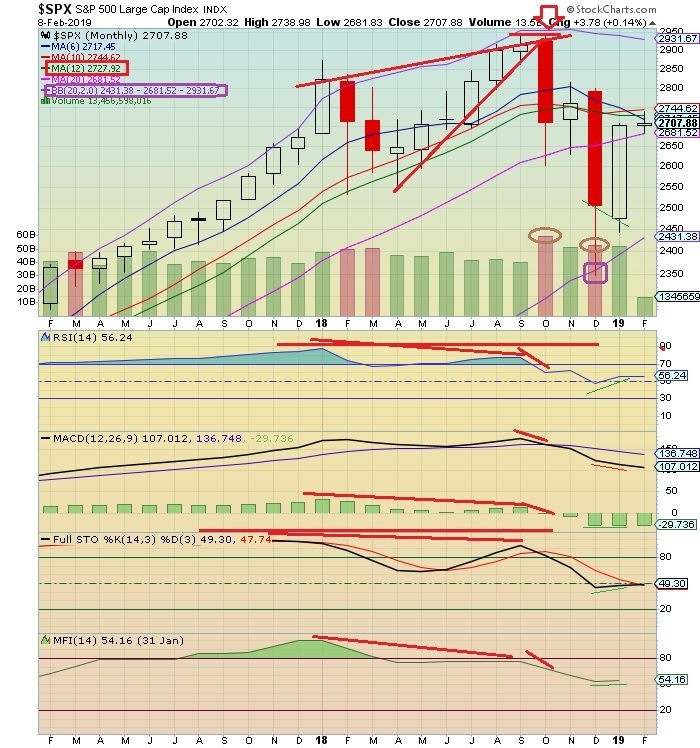 The bears would have one last chance to stop the joy with the 10-month MA resistance at 2745. A spankdown from here would require a back test of the 2728, and such an important level would need a back test anyway. But, if the bulls run above 2745, the Wall Street Einstein's calling for SPX 3000 and higher may not look foolish this year after all. Stocks will run strongly higher. Of course each day the S&P 500 remains below the 12-month MA at 2728 is another nail in the bull's coffin. The two volume candlesticks representing the selling months of October and December (brown circles) are greater than any bullish buying which is a negative for the stock market going forward. Watch SPX 2728 since it is the decider. This information is for educational and entertainment purposes only. Do not invest based on anything you read or view here. Consult your financial advisor before making any investment decision.